A genetic scan of a massive number of samples taken from tuberculosis patients across China has shown a surprising genetic uniformity: just two "strains" of the tuberculosis bacterium account for 99.4 percent of all cases. "Yes, I was surprised at the lack of diversity in the bacterium," said Caitlin Pepperell, an associate professor of medical microbiology at University of Wisconsin-Madison. Pepperell is a corresponding author in a paper published online today (Nov. 5) in Nature Ecology and Evolution that looked at 4,578 samples from patients in China. Pepperell's co-authors included Qian Gao and Qingyun Liu, both at the Shanghai Public Health Clinical Center and Fudan University in Shanghai. The most likely explanation for the uniformity of TB strains in China is political. Movement into the old empire was limited by dynastic policies of seclusion, Pepperell says. "The hypothesis my colleagues and I use to explain the surprising lack of diversity is that at the time when the current TB epidemic was taking hold in China, there was less contact with other regions compared to contemporaneous societies elsewhere, but there was a lot of movement within China." And because apparently few other strains were introduced into China, the result is a picture not seen elsewhere—of two dominant strains in a pandemic that has persisted for a thousand years or more. Several features distinguish TB from other pathogens and make its evolution dependent on human behavior. Mycobacterium tuberculosis does not share DNA with other species of bacteria. This dangerous phenomenon, called "horizontal gene transfer," allows rapid movement of traits like antibiotic resistance among bacteria. The new study adds to an emerging picture of the movement of the dangerous and persistent TB epidemic across the globe. 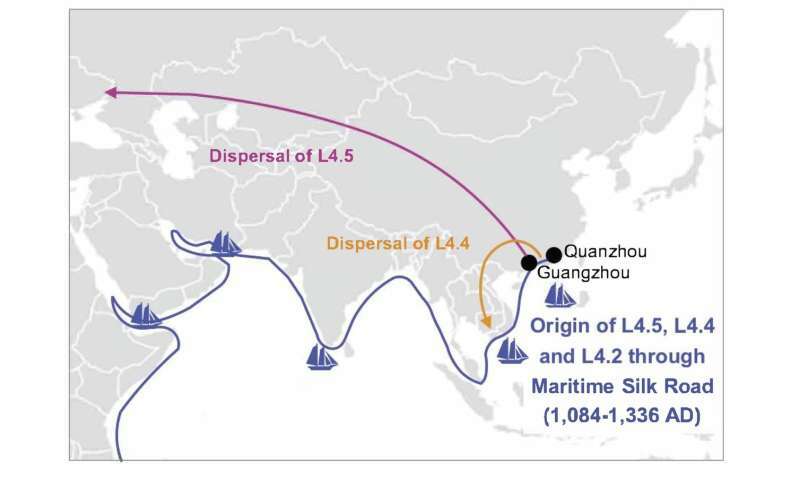 In a recent report in Science Advances, Pepperell and colleagues studied Lineage 4, the predominant international strain, and concluded that "repeated sourcing from Europe has been the main driving force for the global expansion of L4, with intense dispersal to Africa and the Americas concomitant with European colonizing efforts" between the years 1600 and 1900. That study also found that strains of TB resistant to multiple drugs in recent decades have "overwhelmingly" remained local. That encouraging finding raises the possibility of limiting the spread of these particularly dangerous pathogens. Pepperell, who practices infectious disease medicine in addition to her research, says a main goal of the genetic studies is to gain an evolutionary understanding of why TB is so difficult to treat and eradicate. "We talk about robustness and adaptability," she says. "A robust organism is strong in the face of perturbations. Adaptability is the ability to change in response to a change in environmental conditions." The current study alone, she adds, "will not tell us why treatment and eradication of TB is so difficult, and it will not change treatment, directly. The overarching contribution of this kind of study is to understand what forces shaped these bacteria. That is obviously relevant to treatment, and to drug resistance, but you can't draw a direct line from what we have found so far, saying, 'These will be the effects.'"